The BMW M badge is coveted worldwide. Now this badge will take center stage on the popular BMW 2 Series in the form of the all-new 2016 BMW M2. With an output of 365 bhp at 6,500 rpm and maximum revs of 7,000 rpm, this all-new BMW M2 is more powerful than its predecessor: the BMW 1 M Coupe. The 3.0-liter 6-cylinder inline engine leads it’s segment in torque with a full 343 lb-ft on tap between 1,400 and 5,560 rpm and the overboost function raising this figure by 26 lb-ft to 369 lb-ft between 1,450 and 4,750 rpm. 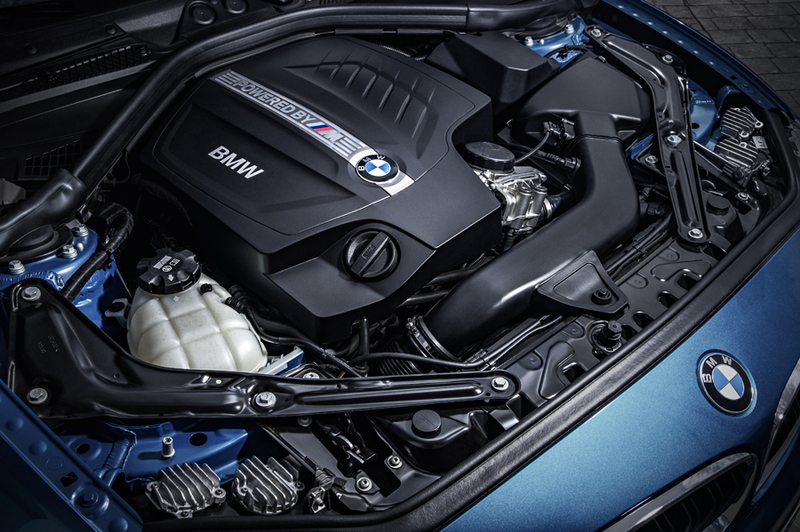 The BMW M2’s engine also propels it from 0 to 60 mph in a scant 4.4 seconds. The top speed is electronically limited to 155 mph. The integration of the turbocharger into the exhaust manifold plays a major role in the ability of the new 3.0 liter 6-cylinder engine to optimize its performance efficiently. The standard Auto Start Stop function and Brake Energy Regeneration provide additional potential for fuel savings, while the intelligent energy management of ancillary components enables an additional reduction in fuel consumption. The BMW M2 comes standard with a six-speed manual gearbox, but it can be ordered with an optional seven-speed M Double Clutch Transmissions (M DCT with Drivelogic). This system, which effectively combines two gearboxes, each with its own clutch, is specially designed to work with the customary engine dynamics of M cars and the engine’s high torque and output. The system detects which gear the driver will choose next based on the engine’s revs, the accelerator position, the level of acceleration and the driving mode, and engages it before the driver has actually moved the shift paddle. As a result, the clutches now only need to open or close for the gear-change process to be completed. The change of gear is therefore executed in fractions of a second. 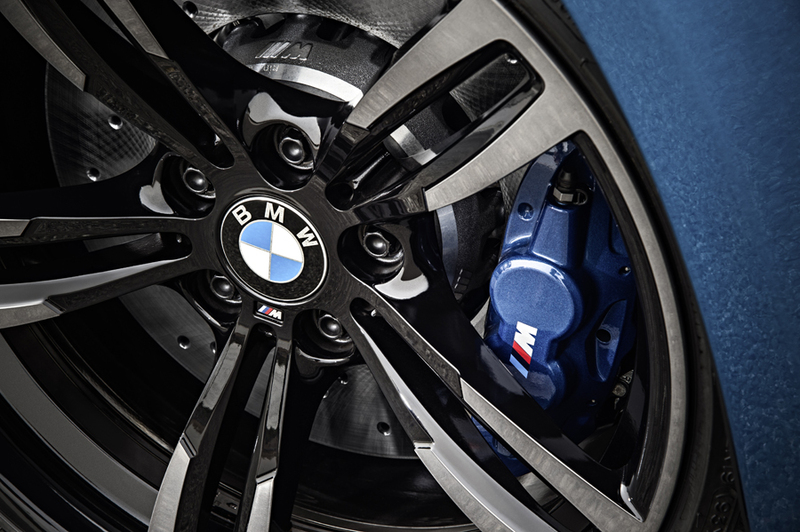 The M2’s high-performance brakes are painted in a blue metallic finish and display the M logo at the front axle. M compound brakes guarantee powerful deceleration in all conditions and providing confidence inspiring fade resistance under hard track use. They are also significantly lighter than conventional braking systems, the brake disc hub is manufactured from aluminum as they reduce unsprung and rotating masses, which means they play a major role in further enhancing the dynamic ability of the all-new BMW M2. In addition to delivering outstanding performance, The BMW M2 beautifully designed inside and out. A glance at the front end reveals characteristic M design features. The signature BMW kidney grille, with its black-painted double bars replicating the design of the M double-spoke wheels, carries the BMW M logo. And the three-dimensional design of the grille has a “shark nose” feel to it. The modern take on the BMW twin circular headlights underlines the car’s forward-surging look and establishes a close stylistic connection with the grille. The broad rear end of M2 highlights its firm grip on the asphalt, a quality further reinforced by the horizontal lines in the trunk lid and rear apron. The M rear spoiler on the trunk lid is also a cool design element. The looks of the rear end are rounded off by another classical BMW M feature. The diffuser integrated into the rear apron is a clear reference to the racing abilities of the all-new BMW M2 and offers a nod to its optimized aerodynamics. Likewise integrated into the rear apron are the familiar quartet of hallmark BMW M exhaust tailpipes in high-gloss chrome. 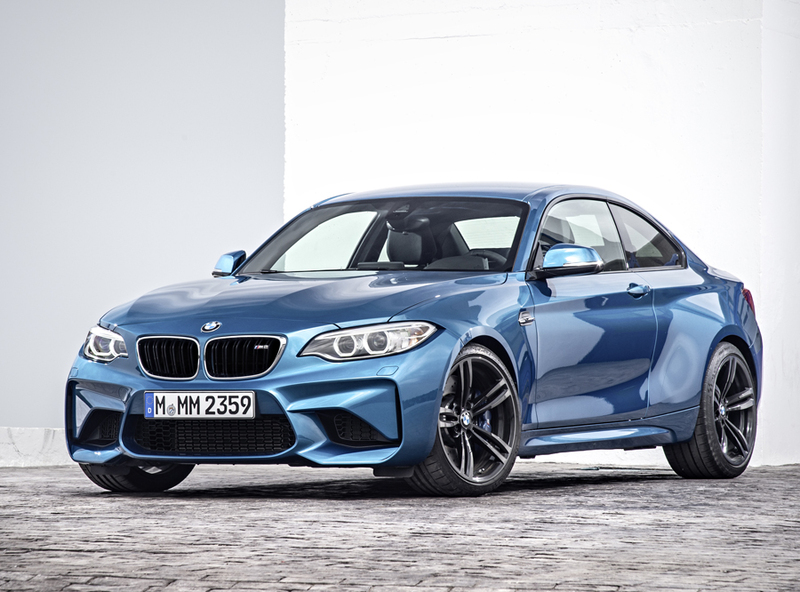 From the side, the M2 is immediately identifiable as a fully-fledged member of the BMW M family. Compact dimensions and hallmark BMW proportions – i.e. a short front overhang, sweeping hood, long wheelbase and set-back greenhouse with classic BMW Hofmeister kink – are the starting point, with signature M design elements strengthening the dynamic expression. The side swage line – which begins rearwards of the front axle then rises dynamically towards the tail and links the flanks of the car with its rear end – is a classical BMW design feature. 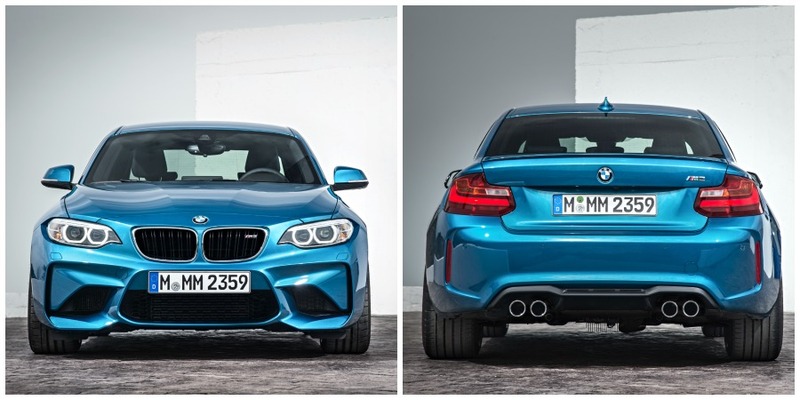 Other typical elements of the all-new BMW M2’s powerful appearance are the sculptural wing extensions at the front and rear axle, which immediately bring to mind the image of a muscular athlete with broad shoulders in a figure-hugging race suit and visually enhance the car’s standout dynamic abilities. 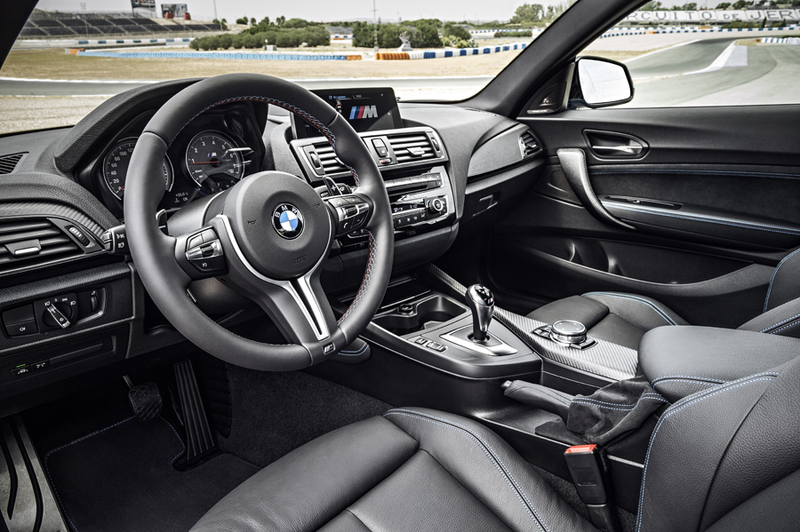 As with all BMW M models, the interior of the all-new BMW M2 stands out with its focus on the driver. The sports seats, in black Dakota leather with blue contrast stitching and an M logo in the backrests, have adjustable side bolsters to give the driver and front passenger optimum support through fast corners. Familiar M equipment items in the all-new BMW M2 also include M logos on the tachometer, gearshift lever, door sill plates and M leather steering wheel with shift paddles. The optional ConnectedDrive Services open up the world of vehicle connectivity to customers, revealing intelligent services and features as well as an extensive range of apps. The GoPro app and the M Laptimer app are geared towards enthusiasts. The later records the car’s speed, longitudinal and lateral acceleration, engine’s speed, the gear engaged at any one time, the steering angle, the accelerator position and fuel consumption. This data allows drivers to subsequently analyze their inputs precisely corner by corner, gives them the option of comparing their laps with those of other drivers and enables them to easily share by e-mail or Facebook. The GoPro app allows drivers to use a GoPro camera to film their fast laps around the race track. 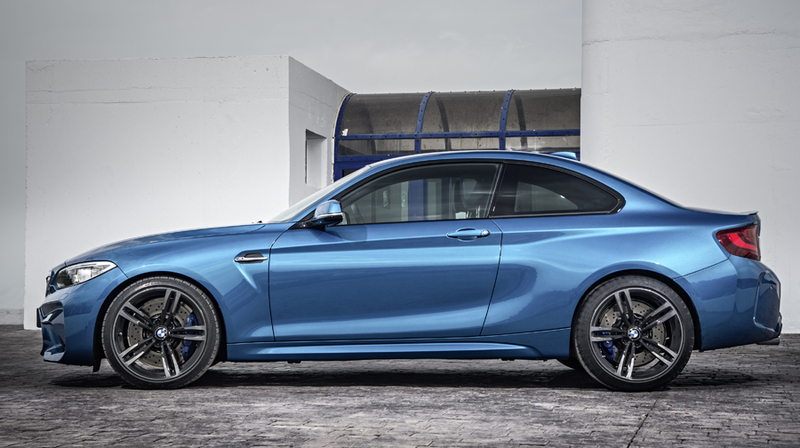 The BMW M2 is available in four exterior paint finishes: Long Beach Blue metallic, Alpine White, Black Sapphire metallic and Mineral Grey metallic and will be available at authorized BMW dealers starting in spring of 2016. Price will be disclosed closer to market launch.